During the late 19th century, Italian immigration to Argentina brought fernet to South America. Fernet has grown steadily in popularity in Argentina ever since, especially in Córdoba. In the mid-1980s, the massive fernet producer Fratelli Branca ran a marketing campaign encouraging Argentinians to mix fernet with cola. Coca-Cola mixed with fernet—sometimes referred to as Fernando—remains a popular drink in Argentina, which is the only country outside of Italy to have its own Fratelli Branca Distillerie. In the U.S., fernet’s first home was in San Francisco, where its popularity predated and then continued through Prohibition thanks to that “medicinal” loophole. San Francisco remains the top consumer of fernet in the U.S., but its sales across the country have steadily grown in the past decade. In addition to myrrh, fernet contains a range of spices and herbs, which can include saffron, chamomile, cardamom, peppermint, aloe, ginseng, angelica, rhubarb, iris, sage, and bitter orange. Ingredients vary from brand to brand, but saffron is one of the most essential. It has a base of grape-distilled spirits and often contains caramel coloring, giving it a warm amber brown color. The taste: Most fernet virgins liken the first taste to mouthwash. While it is true that fernet’s flavor profile has a minty start, it’s more balanced and complex than the mouthwash comparison allows for. Unlike its bitter-sweet sister amaro, fernet is all bitter. The sugarless black licorice taste can be off-putting to first timers, and the myrrh gives it that mouthwash/cold medicine vibe. But once you accept fernet for the intense, herbal drink that it is, you’ll open your mind to its wonderful, warming combination of flavors. Fernet’s many flavor layers make it a great addition to cocktails in need of a little kick, but it’s delicious on its own, too. The first wave you’ll get is that bitter mintiness, followed by a more balanced taste that’ll leave you wondering: What was all of that? It was 25-plus herbs and spices working together. Composition of ingredients vary regionally. In Italy, you’ll get more saffron coming through. American versions tend to be mintier, and in Argentina, rhubarb has a stronger presence. Where some taste mouthwash, others taste something like an herbal cola, which is perhaps why it mixes with Coke so well. Possible gateway: In 1845, Bernardino Branca invented Fernet-Branca in Milan. 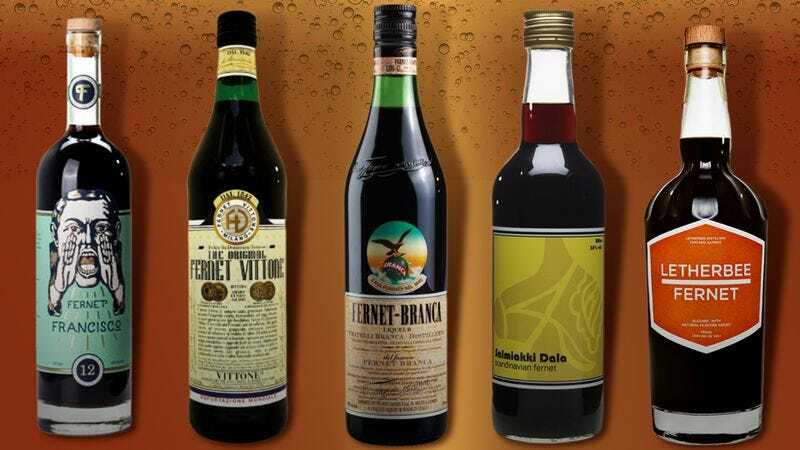 His recipe—which remains a tightly guarded trade secret à la Coca-Cola but includes 27 herbs and other ingredients—went on to become the most recognizable fernet brand in the world, manufactured by the aforementioned Fratelli Branca Distillerie. If you ask a bartender for fernet, there’s a 97 percent chance you will be served Fernet-Branca, a brand name that has become conflated with the more general term. Its thin green bottles sporting an eagle perched atop a globe are ubiquitous in the cocktail bar world. Fernet-Branca has become popular within the industry, especially in New York City, where taking shots of fernet signals insider status. It’s a bartender’s drink. Fernet-Branca’s top-secret recipe sources from four continents, including aloe from South Africa, rhubarb from China, gentian from France, galingale from India and Sri Lanka, and chamomile from Italy or Argentina. And it’s one of the largest importers of saffron in the world. Though it has never eclipsed Fernet-Branca in popularity, Original Fernet Vittone is actually, as its name suggests, the first fernet brand in the world. Though not as omnipresent as Fernet-Branca, it tastes very similar. Next steps: The Nordic offshoot of Bittermens, Dala Spirits, has a “Scandinavian-style” fernet called Salmiakki Dala, inspired by the bitter licorice candies, Salmiak. This take on fernet is heavy on the licorice and, like the best of fernets, has an aromatic start and a bitter finish. Chicago’s Letherbee has come up with a modern take on fernet that appeals to a more American flavor palette, including hints of coffee, chocolate, spearmint, and cinnamon. Fernet haven San Francisco also has its own fernet now: Fernet Francisco offers a slightly spicier rather than minty take on the spirit. If fernet’s bold bitterness is holding you back from becoming a fan, there are technically some sweeter variations that are good if somewhat sacrilegious to fernet’s origins. Denver’s Leopold Bros. makes a “fernet” that’s much fruitier and more port-like than the Fernet-Branca standard. It’s worth trying, but if you blossom into a fernet purist, skip it. Talk like an expert: Frankly, fernet experts tend to be no-frills. There’s no need to muddle your order with flowery language. Just get fernet, neat, and you’re likely to earn respect from your bartender.